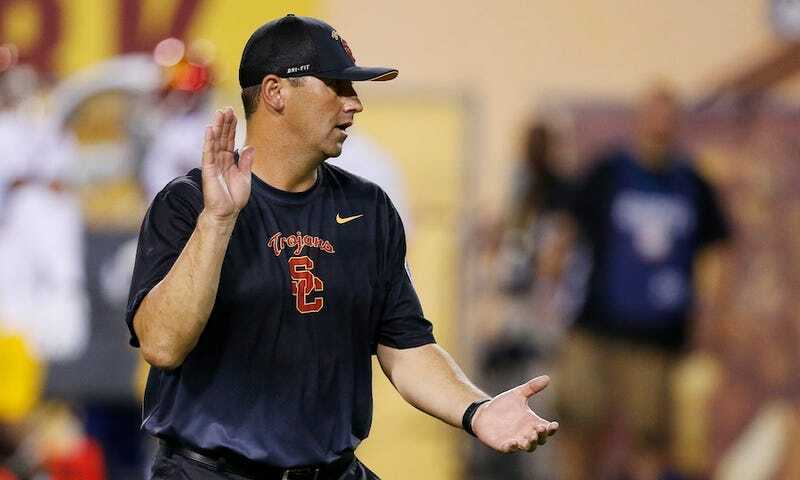 USC football coach Steve Sarkisian said he’d take a leave of absence yesterday after showing up to practice “in no condition to work” Sunday, but athletic director Pat Haden made the decision today to fire Sarkisian outright. After careful consideration of what is in the best interest of the university and our student-athletes, I have made the decision to terminate Steve Sarkisian, effective immediately. I want to thank Clay Helton for stepping into the interim head coach role, and I want to add how proud I am of our coaching staff and players and the way they are responding to this difficult situation. Through all of this we remain concerned for Steve and hope that it will give him the opportunity to focus on his personal well being.